On Saturday, April 25th 2009, Yorkshire's regional centre Kagyu Dechen Dzong was honoured to welcome Lama Jampa to the Harrogate area to teach 'The Four Dharmas of Gampopa' (an incisive overview of the path by one of the founding fathers of the Kagyu tradition) and to give the initiation of Milarepa from the lineage of Jamgon Kongtrul. The teachings took place in the beautiful surroundings of Kettlesing Millennium Village Hall, nestling in the Yorkshire dales. On Lama Jampa's visit to this rural venue last November, he was met with biting winds and a snowy landscape, but on this occasion there was May blossom, spring foliage and newborn lambs. The morning session was open to the general public, the afternoon initiation being exclusively for practitioners; both were very well attended, with sangha members travelling from all over the country. Lama Jampa gave refuge to two new students during the course of the day. A Dharma School for children, focussing on 'the suffering of change', was presented during the morning session, whilst a successful catering operation, afternoon crèche and Dharma shop were also in place. 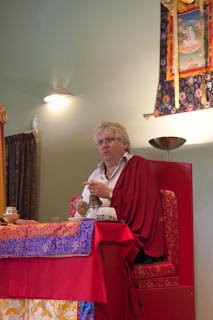 We look forward to Lama Jampa's return to the Region later in the year when he will be giving a public talk in Leeds.